English education students typically achieve a 90-100% pass rate on the Praxis II licensure exam. Following Jesus Christ is what really matters. And at Bob Jones University, we’re committed to preparing you to become an effective teacher as you follow the Master Teacher. The English education program at BJU will prepare you to be an effective, innovative and Christ-centered educator, whether you teach in a public, private or Christian school. Our program is approved by the South Carolina Department of Education and leads to initial South Carolina state licensure (certification to teach grades 9-12 in a public school setting). Graduates from BJU’s English education program have been accepted into leading graduate schools and are teaching both nationally and internationally. BJU’s English education program ensures that you’ll gain proficiency in speech, writing, grammar, literature, technology and pedagogy. You’ll develop a thorough understanding of English language arts in your content area classes—including Structure of Modern English, Multiethnic Literature, Expository Writing, and Teaching Speech & Drama. Through your education classes—Theories of Teaching & Learning, Teaching Reading & Writing in the Content Areas, Teaching English: Writing, and Teaching English: Literature—you’ll develop your own working educational philosophy. In one class, you will create a Christian worldview statement specifically concerning the teaching of literature. Your methods and technology classes will provide experience with diverse teaching strategies and up-to-date educational technology. Some of your projects will include creating a graphic novel for teens and developing a three-week teaching unit on a major literary novel. Most importantly, you’ll gain real-life experience in the classroom through varied practicum experiences in your sophomore and junior years. Finally, during your senior year you’ll complete your degree with a semester-long clinical practice, enabling you to work in a local high school classroom setting with an experienced English teacher. You may choose to supplement your program with a minor closely related to English education, such as creative writing or teaching English as a second language. Or you may choose to fit in a variety of extra classes according to your personal interests. The English education program at Bob Jones University has molded me into the student I am today. Its consideration of each student individually caught my attention immediately. Coming into a large school like BJU, I was concerned I might get lost academically, but from the start, my advisor knew my name and immediately started to build a relationship with me. There are numerous times I have gone to her about academic and personal questions because I know she cares about me as a sister in Christ. Besides preparing me to be a teacher, the program has equipped me to participate in extracurricular opportunities outside of the English realm. I was given the opportunity to travel on the University’s Drama Ministry Team during one of my semesters of college in which I used skills from classes I had already taken within my major. This experience was life changing, and I would have never been able to participate without the encouragement and challenge of the English education department. In addition to encouraging me to travel, my advisor worked with me to ensure my education would not be hindered while I was away for a semester. I have also been involved in university choirs for three years now. Being able to extend myself outside of my major has been a huge outlet for me, but the English education department is never far away. The faculty can consistently be seen attending concerts and special programs in which English majors are a part. Seeing that support is priceless to me and really shows unity within all the departments on campus. I am excited to go into the world and begin teaching what I have learned and to use the loving spirit all of my teachers have instilled in me. 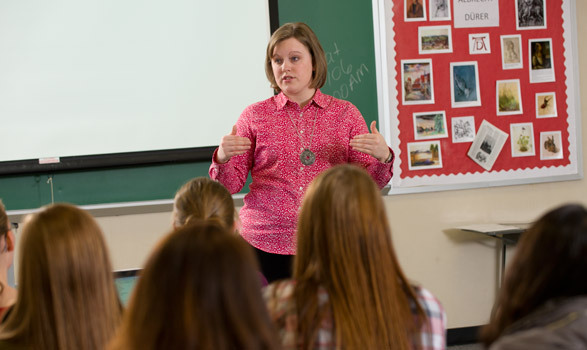 An English education degree at BJU opens up a variety of employment opportunities to you. English teacher, Langston Charter Middle School, Greenville, S.C.
Reading teacher, Robert Anderson College and Career Academy, Anderson, S.C.
English and Spanish teacher, Faith Baptist School, Fredericksburg, Va.
English and drama teacher, Blue Ridge High School, Greer, S.C.
English curriculum author, Bob Jones University Press, Greenville, S.C. Writer for Bob Jones University marketing department, Greenville, S.C.
By the time you begin your clinical practice your senior year, you will be well prepared with various unit plans and lesson plans—as well as at least 100 hours of classroom experience. Clinical practice is the capstone experience of your preparation. You’ll have the opportunity to spend a semester in a local public high school, working with an English mentor-teacher there. You will also receive weekly feedback from both your mentor-teacher and BJU professor. Every fall Bob Jones University hosts the Special Olympics Developmental Games for students from Washington Center, a school for children and young people with severe mental disabilities. Education majors from BJU assist the student athletes in activities and games as the athletes’ families and teachers cheer them on. Our English and education faculty average more than 25 years of experience in their fields, including years of researching literary masterpieces, creating and using visual technology, performing drama, and teaching high school. They inspire love of writing and literature and enjoy helping you grow in your teaching ability and in your love for your practicum and clinical practice students. Our faculty are good examples of godly Christians and of teaching professionals. Exhibit thorough English-related, literacy-based knowledge and skills. Design curriculum and educational plans in conjunction with current pedagogical skills. Exemplify current pedagogical skills in teaching. Create a biblical worldview declaration for a literacy-based high school English classroom.